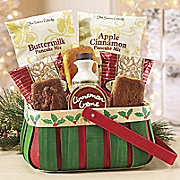 When the holidays come around we are always looking for yummy goodies and treats. A great place to find those tasty treats is The Swiss Colony , and they happen to be celebrating 85 years, WOW! 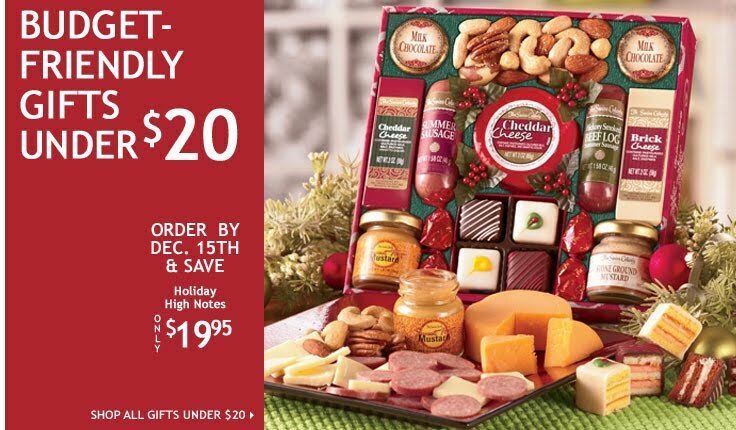 The variety they offer is huge, the categories range from Candy and Chocolates, Cheese and Meats, Gift Baskets, Nuts and Snacks, and more. We love chocolate around here so we were excited to try the Snowman Truffles. 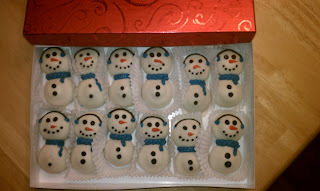 Not only are they super cute because they are in the shape of little snowmen, they were quite tasty as well. The outside is a white chocolate and the inside is a smooth milk chocolate. 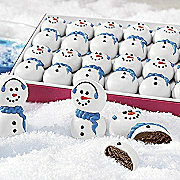 Mmmmm perfect :) Each snowman is two truffles stacked on top of each other, you have to eat both because they go together right? Way less guilt about eating all of that Christmas Chocolate, at least that is what I tell myself! Look how cute the little snowmen are!! Simply send the Petits Fours to someone on your list, and we'll send a Gingerbread House to a child in a hospital in your region. We'll let your gift recipient know that a Gingerbread House has been sent to a child in need, in their name, at your request. Plus, a "Thank You" card will be sent to your gift recipient from the hospital to recognize their gifts to these special children at Christmas. Gingerbread House and candies are 1-lb. 11-oz. net wt. This special gift distribution is made possible by the arrangements of the National Association of Children's Hospitals and Related Institutions, Inc. 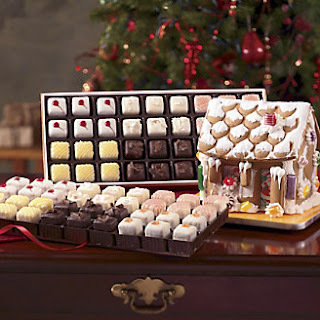 NOTE: Note: Gingerbread House Program is only available with purchase of 72 Petits Fours (shown here). 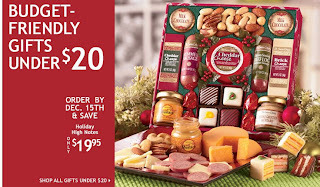 Check out The Swiss Colony for all of your holiday snacks and treats, they are delicious! What is your favorite Swiss Colony product? I like the Christmas Breakfast...it's perfecr for Christmas breakfast! My favorite product is Chris mouse. I love the Dobosh Tortes! Their penguin truffles look adorable too!